You would think that a 37-year-old band would rest on its laurels... right? No, not Incognito! The band is as creative and full of fire as it was at its conception in 1979. A rare feat in these days and times. 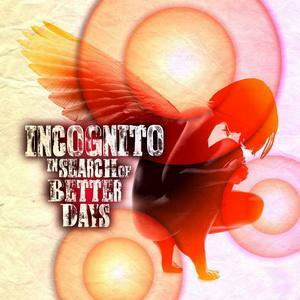 Their 17th studio album, “In Search of Better Days”, will have Incognito fans grinning ear to ear and will be released on June 24th, 2016 on earMusic. The fresh, uncompromising, soulful, Jazz-Funk-laden songs and instrumentals that are the bones of Incognito continue to shine through... and there is more. The sound of Bluey’s London for over three and a half decades weaves its way throughout this album and gives it flesh, with splashes of Drum & Bass and Broken Beats, Rare Groove, Deep Soulful House, and even influences from the Rock and Blues that were at the heart of the UK scene in the late ’60s and early ’70s. From the driving bass of featured guest Stuart Zender on the opening track, you know that this album is upping the ante and it’s going to be one hell of a good ride! Imaani, Vanessa Haynes, Tony Momrelle, Katie Leone, Vula Malinga - the UK’s finest and most soulful voices hit you relentlessly one after the other with songs that will remain with you from the first hearing. And as if that was not enough to make this one of Incognito’s best albums, in comes American chanteuse extraordinaire aka “the voice of Incognito” - Maysa, to seal the deal! Other special guest artists - including pianist Avery Sunshine, drummer Richard Spaven, cosmic percussionist Jody Linscott, and Japanese guitar legend Tomoyasu Hotei of Kill Bill fame - leave their indelible marks on this much-anticipated release. As Bluey continues blazing his own trail with his ever-expanding community of top-of-the-line artists, fueled by a passion for storytelling and creating unity through the Groove, Incognito’s “In Search of Better Days” takes us there. This album is... Truth!